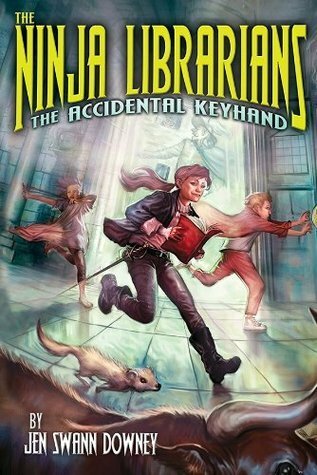 A year ago I added THE NINJA LIBRARIANS:THE ACCIDENTAL KEYHAND to my future books to read list. The recommendation came from another MMGM blogger (The Reading Nook). My list has now grown to over 80 books and this title would still be there if author Jen Swann Downey hadn’t contacted me to announce the recent release of the paperback version. She graciously sent me a copy and I took to it right away. What a marvelous world we have at Petrarch’s Library. There’s mystery, a large cast of unique characters, and magical surprises. Dorrie is an endearing MC who we follow as she and her older brother explore this unique place. Conflict and danger lurk in the shadows and the final 50 pages left me breathless. The good news at the end of the paperback version is a sneak preview of the sequel, THE NINJA LIBRARIANS: SWORD IN THE STACKS, due out in late 2015. Avid readers from MG on up will devour the pages, but reluctant readers will most likely pass at it’s hefty size. They’ll miss out on a fantastic debut by a very talented writer. I’ll be waiting anxiously for the next adventure. When Dorrie and her brother Marcus chase Moe-an unusually foul-tempered mongoose-into the janitor’s closet of their local library, they make an astonishing discovery: the headquarters of a secret society of ninja librarians. Their mission: protect those whose words get them into trouble, anywhere in the world and at any time in history. Petrarch’s Library is an amazing, jumbled, time-traveling secret base that can dock anywhere there’s trouble, like the Spanish Inquisition, or ancient Greece, or…Passaic, New Jersey. Dorrie would love nothing more than to join the society, fighting injustice with a real sword! But when a traitor surfaces, she and Marcus are prime suspects. Can they clear their names before the only passage back to the twenty-first century closes forever? Fourteen-year-old Marcus is a hilarious sidelight to Dorrie’s more serious side. His comments had me laughing at unexpected times. He’s all boy and often speaks before he thinks in his favorite Star Wars way. Dorrie is not your typical female main character and that’s what makes her special. Sword fighting is her passion, but in the 21st century she is more of a pretender. Her internalization of each event are superb and it doesn’t take long for you to have an attachment to to this girl. Feisty and strong – a great role model for young girls. When an author creates an imaginary world so vivid you want to visit, that alone is a success. What the residents can do with books at Petrarch’s Library is one of the coolest ideas I’ve ever read. In the back of the books is a welcome guide to the people, places, and other marvels found in Petrarch’s. Fun to relive what you already know and learn a few more things. The underlying theme of censorship is a bold one to take on, but what a fantastic way to introduce young readers to the struggles authors have had in the past to get their written words to an audience. Twelve-year-old Dorothea Barnes was thoroughly un-chosen, not particularly deserving, bore no marks of destiny, lacked any sort of criminal genius, and could claim no supernatural relations. Furthermore, she’d never been orphaned, kidnapped, left for dead in the wilderness, or bitten by anything more bloodthirsty than her little sister. 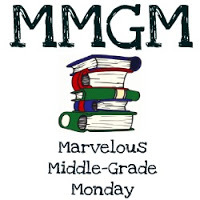 This entry was posted in Reviews and tagged Jen Swann Downey, Marvelous Middle Grade Monday, MG book reviews, Middle grade, Ninja Librarians. Bookmark the permalink. This sounds like a great story. I love libraries so I really think I’d like this one. Glad the author contacted so you shared this with us. Oh, great title! It sounds quite entertaining, especially with a library for a setting! Ninja librarians? This sounds fantastic! Thanks for putting it on my radar! What a great quote from the author. I’ve always loved libraries too, and even worked in one for four years. I remember hearing about this book from other MMGM blogs but alas, it’s still on my TBR list. I’m intrigued by the “cool idea” of what the residents can do with the books. What a wonderful concept. I love libraries, and I love the idea of combatting censorship through time and history. The characters sound like a great group to spend reader time with. I remember hearing about this one too. It sounds fantastic. I love all the references to real historical events and the premise! I will have to move this up my TBR list as well. This sound like a terrific story. I’m so glad to hear there is a guide in the back of the book. At my age, I need that sort of thing! Thanks for telling me about this book. I’ll be looking for it. We can all use a little help with intricate stories like this one… I’m sure it has nothing to do with age! Hmm, this sounds interesting. I’ll make sure to add it to my TBR list. Thanks for the review! I couldn’t put it down and I’m 85! Jen Swann Downey’s “The Ninja Librarians” is not just for the young. As a senior, I found it refreshing to witness how easily this writer weaves history and general knowledge into her writings for the younger generations. Her use of language speaks beautifully to old and young readers. And while writing intelligently, she thoroughly entertains. I agree. Now maybe I’ll give this copy for my mom to read! Thanks for your thoughts. This is a unique book! Ninja wouldn’t have attracted me to a book, but your review certainly put the story into perspective. I am glad I read your thoughtful review. The fact you want to go live in this imaginary world, says a lot about the story. I may have to read it and then give it to my granddaughter. I’m going to be reading this one soon, so it’s good to know you give it a thumb’s up!